Staying in Bed & Breakfast Huize Norman (Norman's House) stands for careless enjoyment. This is possible since october 2009. This completely refurnished mansion has been converted to a trendy B & B with sleek interior and a retro touch. 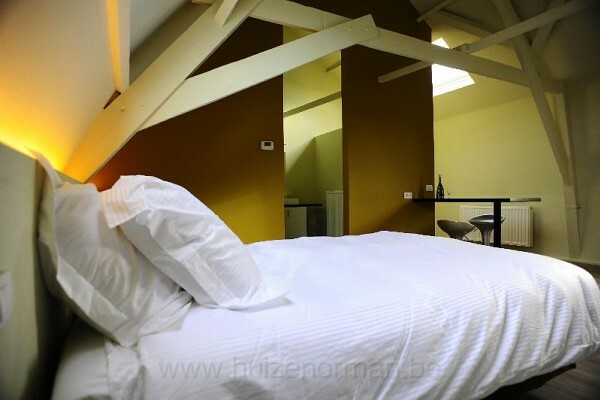 Situated in the middle of the Flemish Ardennes and a stone throw from the centre of the city of Oudenaarde. Huize Norman offers you 3 hip rooms and 1 luxury suite. Every room has a typical atmospheric furnishment inspired by a “one-liner” and are equipped with all modern comfort. The rooms can accommodate up to 4 guests with a maximum capacity of 10 persons. An extensive breakfast with local products en fresh delicacies will be served. Many extras like chocolate and/or Champagne breakfast are possible. The 3 hip rooms are situated on the first floor. The rooms are named and furnished regarding an inspiring “one liner”. The name itself will reveal a little bit what you can expect. Every room has its private bathroom or luxe shower besides comfortable box spring beds, television, cabled ore wireless internet. Children are welcome. Under the age of 3 they can sleep free of charge in their parents room. Everything is present for the little ones: a child bed, bottle warmer, refresh cushion, baby chair, toys and even a little friend. All prices include towels and extended breakfast. Children under the age of 3 sleep free of charge in their parents room. A child bed is available. gereserveerd met gaarne "rustige "kamer. Antwoord: al onze kamers zijn rustig. Bleek op eerste verdieping aan straatkant met heel druk verkeer, tot laat/erg vroeg.Zeer slecht geslapen.Ontvangend meisje (eigenaar was er niet)was slecht geïnformeerd t.a.v parkeermogelijkheid, evenmin concreet advies tav restaurants("er zijn er voldoende op markt, viel op maandagavond erg tegen.Bij het wel goede ontbijt onvrede over kamer geuit aan eigenaresse: ja, het was de laatste kamer!!! Het ging dus blijkbaar alleen om de centen en niet om de wens van de gast.Gastvrijheid is hier dus een hol begrip.Geen excuses of spijt betuigd. Did you stay in Huize Norman? Let us know what you thought about it and help others to make the right choice! * I confirm having stayed in Huize Norman.